Moving to a new country is never without its frustrations and problems. I’ve had a few of both, but nothing too serious. If something really annoys me, I need several beers, but the view always has the same calming effect. You see, the house I rented was completely empty. No appliances. No aircons. No furniture. No nothing, except for some bizarre-colored drapes. I can’t decide if they are pink or orange. I call them “porange.” So, in addition to the usual unpacking and placing of furniture, I needed a major buying spree. Actually, most of my furniture could be disassembled, and when I did that, I carefully put every screw, nut, bolt, whatever, into a freezer bag. One bag per item of furniture. Then, all the bags went into one plastic box with a well-fitting lid, so I could be sure nothing would be lost. Smart move … except I lost the box! I had visions of not being able to rebuild any of the furniture unless I could recall exactly what was needed for each item, and could explain to someone what I needed to buy. I figured one large box must have not made the trip, or had not been placed on the Thai truck. But after close to two hours of searching while silently cursing the moving people, the box magically appeared. A senile moment had occurred! Buying major items can be a challenge, especially when they have to be delivered and installed. But my trusted friend and interpreter Anna did sterling service, and everything happened swiftly and efficiently. Actually, having read many farang grumblings on the various Thai forums, everything happened way more efficiently than I expected. I guess most farangs who come to live in Thailand have never lived anywhere else in Asia, so they try to equate efficiency with what they experienced back in farang-land. The five guys who fitted the aircons didn’t stop working from 9 to 5, except maybe for a 15 minute break. I never saw them eat nor drink. They just worked flat out. I was so impressed I went back to the store to pass my compliments to the owner, who looked pleased but somewhat embarrassed. I’m guessing that’s never happened before. But, I figured, give credit where it’s due. Anyhoo, most of what I needed is now installed and working, except … none of the instruction booklets is in English. I flipped through the fifty page washing machine manual in horror. WTF. But when I looked at the machine, I noticed the button labels were in English. So after selecting some mid-range settings for most things, pressing a button labelled “Fuzzy” … because, well, most of the time I am fuzzy (there is another reason, but only one reader will know what) I hit “Start.” An hour later everything seemed to have survived, except there must have been a leaflet of some kind inside the drum, because everything came out covered in soggy bits of white paper. Aircons don’t need instructions, so no problem there. But it would have been nice to know how to setup my UPS. The power goes off several times a day, but usually only for just long enough for the computers to crash. I found the maker’s website, but that was also in Thai. Then I found an e-mail address and politely asked if they could send me instructions in English. The e-mail bounced. More beer on the balcony was needed. One of my major frustrations was in getting internet service. 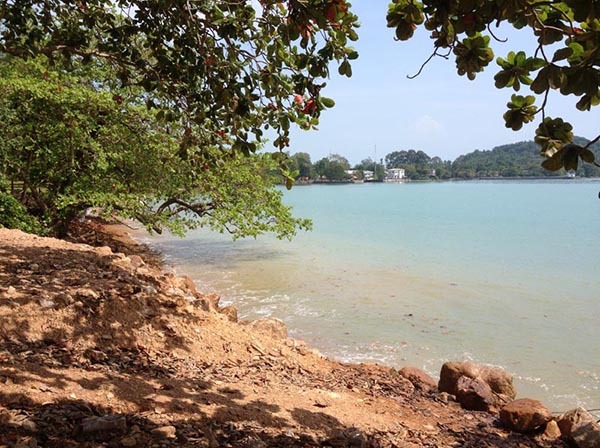 To do almost anything, it needs a trip to “the city.” That’s Nakhon Si Thammarat, about an hour away. 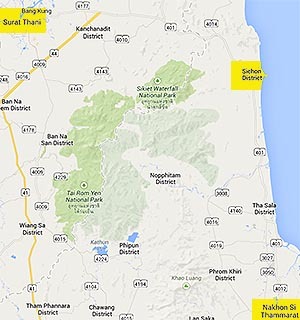 I’m already tired of the drive, and am thinking of sharing my shopping trips between Nakhon and Surat Thani, which is a little further away but in the opposite direction. I sometimes feel like I’m in Ontario because every trip involves a drive on the 401. But, every time I tried to get broadband, I heard the dreaded words, “Ahh, not yet available on your street.” Okay, I’m a bit remote. 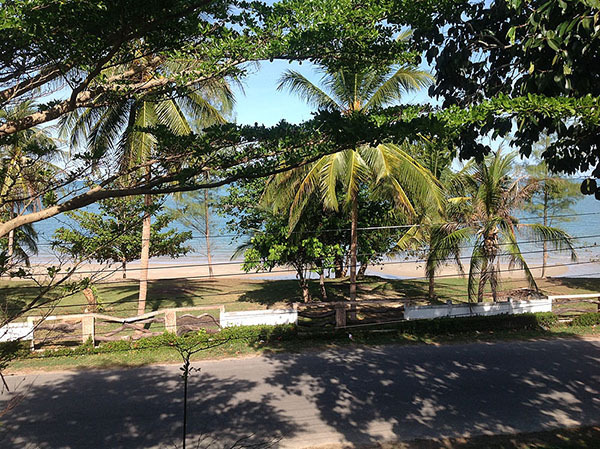 A few kilometers from Sichon town, but there are resorts on either side of me. Surely they need broadband? Anyways, without me having to make yet another trip, Anna turned up with a 3G wireless router thingy. It’s great. It’s fast, it’s tiny and yet the range seems good, and you can connect up to ten devices. I only have seven, so that’s okay. A few left for visitors. Actually, right now I only have six. Anna has gone to Italy with my iPhone, and since she tends to lose or break something of significance every day of her life, I’m not expecting to see it again! However; the 3G-thingy had one major problem. No password. The instruction booklet measures about 4x2cms, but the pages have the same amount of info as an A4 page! The only way I could read it was to do a high-resolution scan and try to read it on-screen. “The password is on a label on the back of the device” it said. 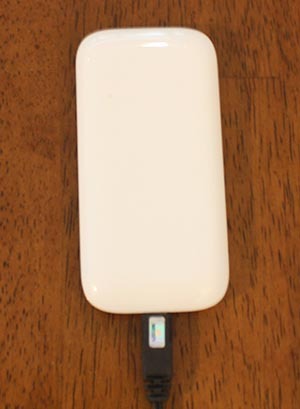 Back of device – no label! No label in the box. No password printed anywhere. A phone call revealed no more info, so it was back to Nakhon. How can anyone read this? “Oh, you can get it from our website” they said, giving me the URL. That turned out to be rubbish. Back to Nakhon yet again. “Oh” they said … “you have to remove the back cover.” Blood pressure was temporarily elevated but sure enough, there was the password. 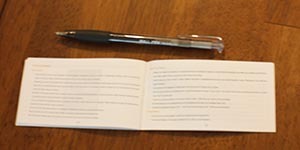 I didn’t even know you could remove the back cover, but now that I have read the really really tiny print in the really really tiny manual, it all becomes clear. Of course, the SIM card and the battery have to live somewhere, why not put the label in there too? Stupid farang. More beers. And don’t even ask me about getting satellite TV, which is called “cable.” No idea why. Best not to ask. I probably wouldn’t have bothered, but my 3G internet thingy is limited to 5GB a month. Since I tend to download most of what I watch on TV, I can use up 5GB a day! So, I figured with downloading severely curtailed, it would be best to watch whatever Thai satellite has to offer, which turns out to be 150 channels of rubbish, plus Formula 1 and MotoGP. So, I’m sort-of happy. But, back to unpacking. Before the aircons arrived, the unpacking was hot sweaty business. I would have pick the hot/dry season to move. Most days were 35degC. Inside was hotter. The upper floor was significantly hotter. One particularly hot afternoon, I was working upstairs setting-up my office, with sweat running down my half-naked body into places best left to the imagination, when my Malaysian mobile rang. “Hello Mr. Russell, this is Diane from the UK Pensions Service. I’m calling to verify the change of address details you sent us.” Good service, but bad timing. I was so hot I could barely remember my name. Somehow I passed the test, giving the correct answers to most of her questions. I also gave her the number of my Thai mobile phone. And the instant I put down my Malaysian phone, the Thai phone rang. “Hello Mr. Russell, this is Diane from the UK Pensions Service. Do you remember we talked just now.” I felt like saying “No lady, I’m so senile I have no idea what happened ten seconds ago.” But then I realized, in a Pensions Service, she probably does talk to old codgers who really don’t know what they were doing ten seconds ago! Anyways, I passed test #2, so I figure they are still going to pay me. Now that I’ve been in my new place for about ten days, it’s really starting to feel like home. I’m still spending half of every day, organizing, cleaning, or trying to figure how to create a kitchen that’s not in the kitchen. You see, the real kitchen is a disaster. I want to have it ripped out and replaced. The cabinets are old and rotten, termite-eaten in places. The rest of the house is great, but the kitchen has to go. Fortunately there’s a lot of space on the ground floor, so it’s not a major problem. Just extra work and $$$s. Okay. It’s almost beer o’clock. I’d sit on the balcony, but it looks like a storm is brewing. Rain at last.